This is the final part in a 3 part review of our Disneyland Paris holiday with a baby and child. We stayed at the Hotel Sante Fe which is a Disneyland hotel on the site. As a result we had to eat each evening at either the hotel or Disney Village. To put things into perspective we went to Disneyland when the exchange rate with the Euro was one off it’s worst ever been. This meant that the high food costs in the restaurants was exaggerated even further. There was one other place where good prices could be found and that is in the mini-supermarket shop inside the train station. Well worth a visit to get cheaper drinks etc. before entering the park. Unfortunately we didn’t discover that shop until well into our holiday. Our first evening we went to Café Mickey. We had been to Cafe Mickey before on an earlier visit to Disneyland Paris. Café Mickey is a Disney themed restaurant where a number of characters come around and visit each of the tables during the meal. 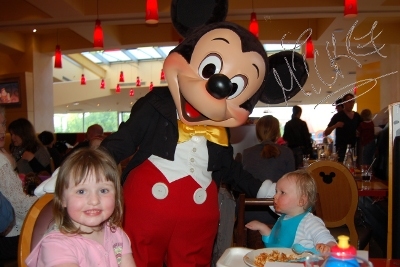 This restaurant is definitely worth visiting if you have children as they’ll love meeting the characters. It’s also a great way to get plenty of autographs and photos. The characters are spread out during the meal, after eating a main and dessert then the same characters were just coming around. The downside is that this is the most expensive restaurant that we visited. A child’s meal was about €16. Food was good and we enjoyed the meal and meeting the characters. This restaurant is very popular so consider booking in advance or try and arrive early. On our second night we went to the Rainforest Cafe. We’ve been to the Rainforest Cafe before in England so we knew it was a child friendly restaurant. 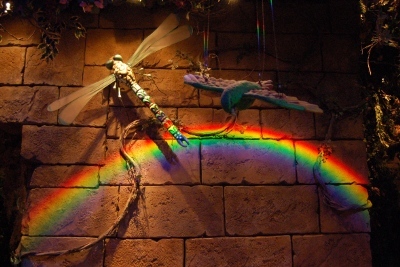 The restaurant is decorated in a rainforest theme and includes some animated animals and the occassional sound of thunder and rain. Fortunately the thunder is not too loud so shouldn’t frighten children, but we did sing I hear thunder to turn it into a came, just in case. Food was good. It was expensive, although not as expensive as Cafe Mickey. All in all a very enjoyable meal. We went to King Ludwig’s Castle partly as we had a 20% off voucher. In fact we had two, one from Thomas Cook (who we booked the holiday through) and one we received from the Rainforest Cafe, but we could obviously only use one at a time. We also got another if we returned to the restaurant on a following night. There was also a promotion on childrens meals at only €7. These offers really helped bring the cost of the meal down. With all these special offer vouchers, it makes me think that they aren’t doing very well, but I think that is perhaps more a reflection on who they are competing against and that they don’t have the same brand attracting people into the restaurant. For us it was in fact a great place to take our daughter as she dressed up as a princess (Snow White) and this was a meal in a Princess’ Castle. The restaurant was nicely decorated and served primarily German meals. There was a good choice of food suitable for everyone. This restaurant may not have the brand names associated with the others in Disney Village, but I highly recommend it. We had decided upon the other restaurants because of their reputation and theme, but after 3 expensive meals (King Ludwigs being the most reasonable out of the Disney Village restaurants) we decided to try the cheaper buffet at the hotel. This turned out to be a great idea, as not only was the meal cheaper they did not charge for our 1 year old son. The restaurant was a Tex Mex all you can eat buffet. There was a good selection of food including salads and spicy and non-spiced hot food. It also meant that the children could try some adult food instead of the usual chicken nuggets and chips the other restaurants offered (although that was available as well). The part of the restaurant that was open when we went in was quite small, but they did open up some more when it became full. There was also a children’s play area with a few toys (which none of the Disney Village restaurants had). We were certainly glad we went to the hotel restaurant and it was much cheaper than the meals we had eaten elsewhere. I’d even recommend visiting the restaurant if staying at a different hotel. We had a great holiday. 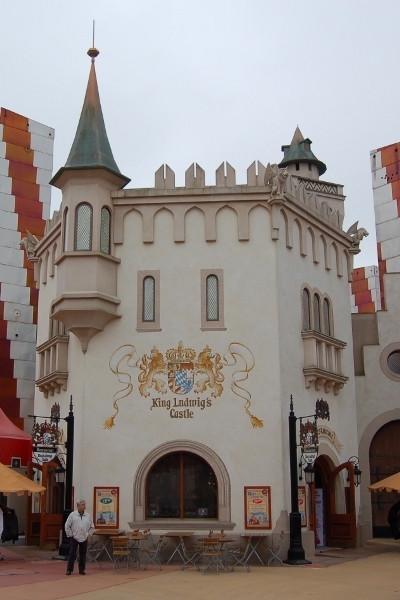 It was very expensive, partly due to it being Disneyland Paris and partly due to the exchange rate at the time. It has provided us with some great memories that we shall cherish. We have lots of photos from the holiday featuring the characters and rides which will be a lasting reminder of the holiday. I would not have wanted to have taken a very young baby on this holiday. Our son is one year old which I think is a good minimum age. It would not be so easy having to deal with sterilising equipment or even just warming up milk due to the lack of facilities in the hotel room. For young babies I’d recommend some kind of self-catering accommodation such as when we went before with our baby daughter travelling by car and staying at a Keycamp caravan site. The downside about the keycamp holiday was the driving, but that was counteracted by the convenience of having lots of boot space and the facilities in the caravan. The caravan holiday was also much cheaper. Flying and staying in a hotel on the park worked well this time. The kids loved the holiday and as a result they were really well behaved and we enjoyed the holiday too. I’d certainly recommend a holiday including Disneyland Paris, either by staying in a hotel or in self-catering depending upon what your budget / circumstances allow. This entry was posted on Thursday, June 11th, 2009 and is filed under Babies, Children, General, Holiday, Tourism. You can follow any responses to this entry through the RSS 2.0 feed. Both comments and pings are currently closed.